It was the summer of 1992, and I had just left work in time to go home for dinner. As I was driving home, God told me to pray. He said to cover my house with the Blood of Jesus, surround my home with Holy Linking Angels and pray for a Spirit of Peace within my home. I prayed as the Lord had instructed as I drove home. Normally when I arrive home, my house was anything but peaceful. With seven children at home, including two teenagers, the noise level could sometimes reach deafening proportions. My two little ones would normally meet me at the door and I wouldn't even get a chance to change clothes before they would wrestle me to the floor to be attacked by the kissing monster. However this particular night when I arrived home the house was the epitome of peaceful. All of the kids were back in their rooms playing and my wife Mauri was in the kitchen preparing dinner. I changed clothes and decided to read before dinner. I selected a Christian book from my library and sat in the living room on the couch to read a little before dinner. As I was reading, I was overwhelmed by the Glory of God. It was to such an extent that I folded the book in my lap, turned my palms upward and just sat and basked in the presence of God. I just sat there smiling, overjoyed by the most exquisite feeling of peace, love and joy that a person could ever imagine. This lasted for a few moments until my twelve year old stepson, Bobby, came into the living room and said, "What are you smiling about?" When I said, "God! ", he said "oh", and walked out of the living room. The next day my wife and I had lunch with our pastor and his wife and they asked us to take over the children's church. When we arrived home our five year old came up to us when we came in the door and said that Bobby had seen a stranger in the house last night. I asked my wife to go find out why Bobby was trying to scare the little kids while we were gone. A few minutes later she came in and told me that I must hear this story for myself. The night before, Bobby had gotten up from his bed and started to go out of his bedroom. Our house at the time had three bedrooms on one side of the house and one bedroom on the other side of the house. Between the living room and the back bedrooms was a long hallway and the two oldest boys bedroom was to the right. When Bobby had started out of his bedroom he made a loud gasp because he saw someone's head peeking around the corner of the hallway. When he gasped, his older brother Lew looked up and all he saw was a reflection in his bedroom window of the hallway light being on, although it was shining a little brighter than ususal. It turned out the hall light had been burned out for over a week and all the kids had been to lazy to change the bulb. Then Bobby proceeded to tell us about the man he had seen looking around the corner of the hallway. He said the man was about a head taller than me, I'm 5'10", had sandy brown hair, sparkling blue eyes and a beautiful smile. Bobby said he felt no fear while looking at this stranger because the stranger's eyes were happy and full of love. The stranger had beautiful, straight, white teeth and his nose was.. Bobby said the stranger's nose was not straight and narrow like yours Craig, or flat like Mom's nose, but it was "A perfect nose". Bobby said, "That is the only way I can describe his nose." I then asked Bobby to tell me what else had happened. Bobby said that he looked at the stranger for a few moments and felt so peaceful. Bobby said he felt no fear only love and gentleness from this stranger. Bobby then walked forward towards the stranger and the stranger disappeared down the hallway towards the living room. As Bobby came into the living room he saw me sitting on the couch smiling. Bobby asked, "What are you smiling about?" I said, "God." And Bobby said, "Oh", and walked back out of the living room. We realized that while I was sitting basking in the presence of God, Bobby was seeing a visitor from God. Mauri and the kids all think that Jesus was the person Bobby saw that night in our home, while I think it must have been an Angel from God. Regardless of who it was that came into our home that night, we all know that we had been blessed by a wondrous, glorious messenger of God. All nine of us sat there praising and blessing God for about seven or eight hours. I believe it was one of the most awesome experiences a family can ever have. That Sunday, Bobby asked me to talk to the pastor and see if Bobby could share this story with our church members. The pastor didn't think it was quite appropriate to be talking about in a Sunday morning service, so Bobby never did get the opportunity to share the story with our church family. However, this is a memory we will never forget. To this day we occasionally will sit around and remember with joy the night God let us know that he sometimes stops in for an unannounced visits. A footnote to this story is that we parents have a responsibility to keep our home ready at all times for unexpected visits by God. Try to set aside a half hour, an hour or however long you as a family would like to have a daily appointment with God. But, make sure if you have established an appointment time to be with God, you aren't late. Don't have the trash on TV blaring when you have invited God into your home to meet with Him. Be ready to meet with God and you will be blessed. End your appointment with God by allowing each member of your family to pray for friends, neighbors, teachers, leaders, whomever, and watch the lives of all be blessed by God. God Bless you and keep you. 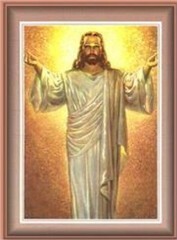 We love You Holy Father, we love You Jesus, we love You Holy Spirit. Help us to acknowledge our love for You always. Amen.